Guido Nincheri’s work has been appreciated by connoisseurs of stained-glass windows and frescoes in church interiors scattered across Canada and New England. Although considered to have been the most prolific religious artist in North America, his work is not well known. 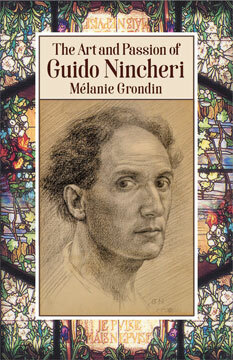 The Art and Passion of Guido Nincheri provides intimate glimpses into the life story of this man of great artistic integrity, and introduces the reader—with 36 colour plates—to a sampling of the churches and one of the non-religious buildings Nincheri decorated, which exemplify his ideals of beauty, decoration, and the public aspect of art. In addition to churches in Vancouver, Toronto, Ottawa, Montreal and Edmundston, and many other cities, Nincheri decorated Montreal’s Château Dufresne Museum and the Roger Williams Museum of Natural History in Providence, Rhode Island. A native of Prato, Nincheri trained at the Academy of Fine Arts in Florence and was influenced by the Pre-Raphaelites and the Italian Stile Liberty. The young artist and his new wife arrived in Montreal in 1913 by way of Boston on the eve of the outbreak of World War I. The author was privileged to have access to both family stories and the rich archival resources documenting the studio, business and private life of the artist. Mélanie Grondin is a writer, editor, and translator living on the South Shore of Montreal. She holds an MA in Medieval Studies from the University of Leeds (UK) and is the editor of the Montreal Review of Books.